"Haiku" does not refer to the Japanese poetry genre. The area is named "Haʻikū" after the Kahili flower. The view from the top of the stairway overlooks Kaneohe as well as Kaneohe Bay. In 1942, contractors for the U.S. Navy began construction of the Haʻikū Radio Station, a top secret facility that was to be used to transmit radio signals to Navy ships that were then operating throughout the Pacific. In order to obtain the necessary height for the antennae, the Navy stretched them across Haʻikū Valley, a natural amphitheater surrounded by high ridges. To accomplish this, they needed “easy” access to the top of the ridges, so they installed a wooden ladder up the mountain. The ladder was later replaced by a wooden staircase. Once the cable car was in operation, most workers preferred to ride the car to the upper hoist house rather than enduring the tedious climb up the stairs. Some remnant parts of the wooden ladder may still be seen beside the metal steps. The radio station was commissioned in 1943. To transmit such a powerful signal, the Navy needed a transmitter of greater capability that was then possible with vacuum tube technology. They therefore decided upon an Alexanderson alternator, a huge device capable of generating powerful low-frequency radio signals, and requiring an antenna of heroic proportions. When the Naval base was decommissioned in the 1950s, the U.S. Coast Guard used the site for an Omega Navigation System station. In the mid-1950s, the wooden stairs were replaced by sections of metal steps and ramps — by one count, 3,922 steps. The station and trail were closed to the public in 1987. Some hikers ignored the "no trespassing" signs and continued to climb, contributing to the local community's misgivings about reopening the structure. In 2003, the stairs were repaired, costing the city $875,000. As of early 2018, land usage rights issues have not been resolved. The City and County of Honolulu has stated that there is currently no plan to open the stairs for public use, citing liability concerns, although it has been noted that the mayor is vocally open to reopening the stairs under his circumstances. In August 2012, Don Tiki show singer and comedian Fritz Hasenpusch died of a heart attack during his Haʻikū Stair climb. In 2014, 6 people were arrested and 135 were cited for climbing the stairs. The City Prosecutors Office has said that criminal trespass in the second degree carries a $1000 fine. Even in simple trespass cases, the judge has the discretion to hand down fines of up to a thousand dollars. Undeterred, many still hike the stairs on an almost daily basis. Some local residents have even installed "booby traps" to stop hikers from passing through their property to reach the stairs. 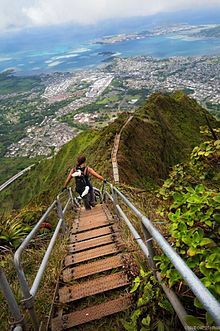 Wikimedia Commons has media related to Haiku Stairs. ^ "The Friends of Haiku Stairs". Friendsofhaikustairs.org. Archived from the original on 2008-04-20. Retrieved 2010-09-04. ^ "Surviving the Stairway to Heaven". untappedcities.com. Alysha mendez. Retrieved 8 January 2015. ^ a b "History of the haiku stairs". haikustairs.org. Retrieved 8 January 2015. ^ "Stairway to Heaven, Oahu". To-hawaii.com. Retrieved 2010-08-23. ^ Cruz, Catherine. "Crackdown on hikers at Haiku Stairs". Retrieved 2017-03-23. ^ Davis, Chelsea. "Injured hiker: 'Booby trap' set up to deter Haiku Stairs trespassers". Retrieved 2018-07-21. This page was last edited on 15 January 2019, at 21:52 (UTC).